"In this sensational soup, sweet potatoes simmer with tomato sauce, half-and-half, thyme, and cashews." Preheat oven to 375 degrees F (190 degrees C). Bake sweet potatoes until soft, about 45 minutes. Remove potatoes, and set aside until cool enough to handle. Then peel, and place in a large bowl. With a large fork or potato masher, mash potatoes for 15 to 20 seconds (they do not need to be mashed smooth). Spoon the potatoes into a large saucepan over medium-high heat. Stir in butter, water, tomato sauce, and half-and-half. Season with salt, pepper, and thyme. Stir in cashews, and mix well. Bring to a boil, reduce heat to medium low, and simmer until cashews are soft, about 50 to 60 minutes. A rich, creamy potato with bacon soup you make in the slow cooker. 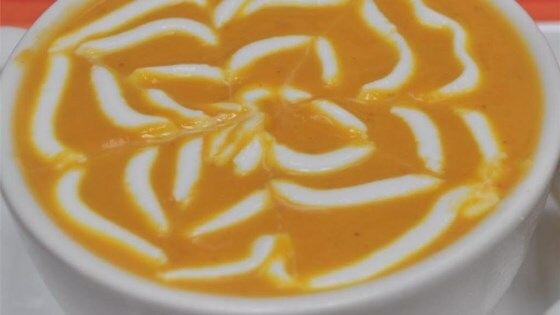 This recipe is from topsecretrecipies.com under Soup Nazi It's really good for an appetizer. Mild flavor. You may need to add more salt and thyme. Adding a little garlic can be fun too. this soup was very bland and uninteresting. the cashews got very soggy and squishy and generally unpleasant. I would not recommend this soup. This recipe was OK but it wasn't very interesting. Also you cannot get half and half in england.